Jo S: Breaking down my list to something manageable was a challenge but it seems the week I tend to think of as the gloomiest of the year in terms of weather and work will instead be studded with bright lights. 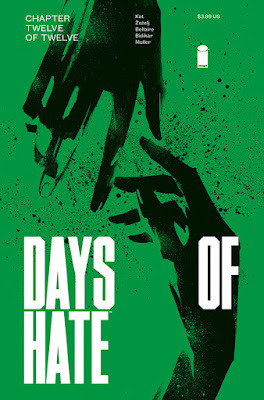 In a normal week, Babyteeth, A Walk Through Hell, Gideon Falls and Joëlle Jones’ spectacular Catwoman would each have taken pride of place in the ‘most anticipated’ spot, but with Days Of Hate reaching its twelfth and final issue, there can be only one choice for that award. Spare in dialogue yet rich in unspoken communication, this terrifyingly credible vision of the near future has been an ongoing lesson in what can be achieved with a tiny cast watched in detailed close-up. Kot's observations on motivation have so far left me uncomfortable at my capacity to empathise with those with even the most monstrous of ideologies. Reaching the end of its arc is Uncanny X-Men, with issue #10 marking the close of a breakneck run of weekly issues. In the time it would usually take to see at most three issues, this has cantered through its story skillfully - I've enjoyed the ‘team’ approach to writing from Rosenberg, Thompson and Brisson more than I thought I would and have warmed to the different elements of the X-Men, especially the ‘kids’. I can't go on indefinitely with something that appears weekly though - it's just too much of a commitment when there are great new titles appearing all the time - so this will be the rounding off point for me. ...and talking of new titles appearing, I'm taking two issue #1s this week (yes, I know I promised myself just one, but I'm weak!). The new Black Widow series is penned by Jen and Sylvia Soska with art from Flaviano and promises a horror twist as Natasha returns from the dead, mad as all hell, with vengeance on her mind. I’m going out on a limb to try the new Invaders series: Chip Zdarsky’s authorship was enough to tip this one over into the positive and the preamble talk of Cap, Bucky and Johnny Storm against former team mate Namor feels like it could be a story on a grand scale. I nearly missed the first issue of The Warning when it appeared and, whilst I'm still not quite sure what's going on in this non-linear story, I'm intrigued enough by the philosophical nature and classy artwork to keep going when issue #3 appears this Wednesday. Wrapping up, I wanted to mention a trade paperback appearing this week; the first volume of Rob Guillory's Farmhand is out and I spotted it in the list with a tiny twinge of guilt: I don't think I've raved nearly enough about this series as it's appeared and hope to correct that now. Clever, mostly non-gory horror, with humour, absurd science and cheeky little artistic touches throughout - this is like a modern, grown-up version of a Beano strip in some ways but that undersells it; please do consider taking a look at this one if you feel our taste in comic books aligns!